Having released a seemingly innumerable number of albums over the last half century plus, Willie Nelson shows no signs of slowing down on the excellent God’s Problem Child. At this point in his unprecedented, legendary career, Willie Nelson has safely earned his place in the annals of country music history and could just as easily rest on his laurels, taking the time to enjoy his twilight years as a virtual god amongst men. But doing what is expected of him has never been Nelson’s forte. From his early years hocking songs to the likes of Patsy Cline through to his co-founding of the so-called Outlaw Country scene to the braided icon and marijuana advocate, Nelson has never been one to follow any predetermined path or play to expectations. And so, more than half a century into his recording career, he’s still putting out new material at an astonishing rate. Of course, this doesn’t always mean that everything he puts out will be on par with his mid-‘70s creative and commercial peak. But even the weakest Willie Nelson album is bound to be better than the majority of what passes for country music at any point in time. Now in particular, with something of an underground backlash bubbling towards the surface in the face of Nashville’s backing-track dominated pop country pap, a new Willie Nelson release serves as a reminder of what country music can and should be when played by real people with real instruments. There is a soullessness to the music of current chart toppers like Luke Bryan, Sam Hunt, Florida Georgia Line and others trafficking in what amounts to little more than pop music with a twang and requisite references to all things blue collar and redneck. So to hear any sort of organic instrumentation on a modern country album is a breath of fresh air, a relief from the claustrophobia of the NashVegas assembly line. Always a Nashville outsider, Nelson here plants his flag firmly within the land of Texas country and its longstanding tradition of exceptional songwriters and musicians. From the honky-tonk of opening track “Little House on the Hill” through to the elegiac balladry of closing track “He Won’t Ever Be Gone”, a gorgeous ode to the late Merle Haggard, Nelson shows himself at 84 to have lost none of what made him such a revered cultural icon. Whether through his raspy, slightly-behind-the-beat cadence, the ancient twang of his battle-scarred guitar sidekick Trigger or reverence for the genre that he arguably helped shepherd through the latter half of the 20th century and into the new millennium, Nelson is the consummate country artist. 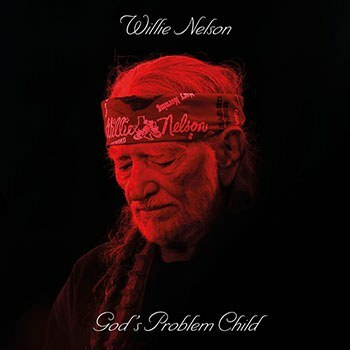 With God’s Problem Child, Nelson delivers a casually low-key affair that calls to mind such classic ‘70s releases as Shotgun Willie and Phases and Stages (the latter in particular with its red-hued cover image), each fully realized collections of songs rather than conduit for the latest single. Having dabbled in blues, jazz, and assorted tangentially-related non-country genres, Nelson’s full-on return to country music here is all the more welcome. Sounding in surprisingly fine voice throughout, his inimitable delivery imbues each and every line with a comfortably reassuring lived-in quality. And it’s this old soul quality that has long been a staple of his approach that now fits him like a finely tailored Nudie suit. Acknowledging his advancing age throughout, his delivery of lines like “You think that you’re still a young bull rider/but you look in the mirror and see an old timer” become all the more affecting. And despite the specter of death and the unstoppable forward march of time, God’s Problem Child isn’t all maudlin sentimentalism. There’s more than a bit of good-natured humor in “Still Not Dead", an up-tempo track referencing the still as yet unfounded rumors of his demise that periodically crop up on social media. “I woke up still not dead again today,” he sings, adding, “the internet said I had passed away.” That he can have such a lighthearted view of what will one day be a major blow to country music calls to mind Mark Twain’s note-perfect quip, “The reports of my death are greatly exaggerated.” Taking this idea and running with it, Nelson remarks upon his seemingly super-human abilities to continue leading the only life he’s ever known: “I ride up and down the road/making music as I go / they say my pace would kill a normal man / But I’ve never been accused of being normal anyway.” Where others would easily settle for a hokey, tongue-in-cheek approach, Nelson plays it straight, make the joke all the more impactful. Both “It Gets Easier” and “Your Memory Has a Mind of Its Own” find Nelson in an introspective mode that recalls such classics as “Hello Walls” and “Funny How the Time Slips Away". The title track, featuring writing and performing contributions from the likes of Tony Joe White, the late Leon Russell, and Jamey Johnson, offers a bluesy bit of country soul that offers each a chance to shine vocally without trying to outdo one another. This sense of collaboration has long been a staple of Nelson’s persona (just look at his guest vocal credits for other artists), and he puts it to fine use here as none of his collaborators overstay their welcome or try to do anything more than that at which they are best. It’s a fine performance from all four, though distracts slightly from the flow of the rest of the album as each subsequent new voice enters the mix. But this is little more than a minor quibble on an otherwise stellar program. While perhaps not a definitive artistic statement, God’s Problem Child is nonetheless an indisputable high point in this late stage of Nelson’s career, one that will no doubt go down as required listening for those who would ever deign to question his continued cultural relevancy. Co-writing the lion’s share of the album, Nelson shows himself to still be far from having run out of ideas or steam. While perhaps a bit hyperbolic, Willie Nelson may well be the greatest songwriter to ever hail from the great state of Texas. That Nashville now reveres this former outlaw shows the lasting impact and significance of the genre’s most recognizable ambassador of goodwill and even better music. We should all be so lucky as octogenarians to still be this relevant.